Pfister has been around for a while, delivering some of the best kitchen faucets in the industry. Its excellent reputation comes from its continued efforts to improve on favored models while also introducing new lines of faucets to stay current with changing trends. It is a great balance that earns Pfister a lot of respect, and is one of the many reasons people tend to give it a try, even over better known brands. There is a lot to love about a company that values its customers so much. Here are some of its best choices from the kitchen line, in no particular order. The 2X high flow filtration system is built on the same GE as hundreds of other professionally installed systems. Available at 1.8 or 2.2 GPM, buyers can choose a faucet that meets their current plumbing setup without having to work around the faucet itself. The easy-to-master feature gives you full control of the water volume coming out of the spray head, making one-handed operations a breeze. The most expensive of the bunch, the Lita is favored by many customers in both its stainless steel and polished chrome models. There is nothing complicated about the way it operates, and a simple push of the handle will dispense either hot or cold filtered water. It’s all about the mechanics of the faucet, and the response of this unit makes it worth the extra money. The 2X high flow filtration system is built on the same GE as hundreds of other professionally installed systems. That means it lasts up to six months, using a balanced dual filter that will keep specific minerals out of your water. When installed, the Lita can be used with or without the deck plate. Other than aesthetic purposes, the deck plate won’t really make a difference to the operation. It will most likely be used in a new home where the system is being installed for the first time. Buyers that are interested in the plate will want to pick up a 961-168S as it is sold separately, but well worth the low price. Since Lita can be installed in a 1- or 3-hole configuration, there is a lot of flexibility. Make sure to have space below your sink for the GE filter and everything will fall into place. Included with the set is a 36-inch nylon supply line and 3/8-inch female fittings, which covers everything you need beyond basic tools to get it set up. The first on the list and one of the best, the Lita is expensive but worth it! The Avanti is a kitchen faucet from Pfister that comes in a lot of styles, offering the best options for people new to the brand. 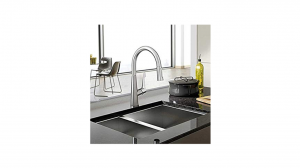 Available in Tuscan bronze or stainless steel, both colors are very well polished and meet the standards one would expect from a kitchen faucet. Like the previous faucet, it also handles ADA, ANSI, and NSF guidelines very well. Both lead requirements and disabled access needs are met with this model, a good heads up for anyone narrowing their choice down based on those results. Unlike the last model, this model is missing a soap dispenser, but the remarkable GPM more than makes up for it. Available at 1.8 or 2.2 GPM, buyers can choose a faucet that meets their current plumbing setup without having to work around the faucet itself. It makes the whole process painless, and takes out a lot of the guesswork when reconfiguring certain areas of the kitchen. The lower flow rate of the 1.8 GPM can even save you money if you set up your kitchen accordingly. All of this is available at a lower price than any other faucets on the list, which is amazing considering how much you get in one package. And don’t worry, there really isn’t that much of a price difference if you get the higher gallon model. Once installed, you’ll notice how much clearance you have thanks to the high arch spout. The included warranty will cover both the functions and finish for life. When using the spray head, stream and spray modes are available but there is no pause function like other items on the list. So if this is your first spray head without the pause function, it’s a slight adjustment but nothing major. And when buying the 1.8 GPM model, you’ll be buying a WaterSense certified kitchen faucet! This is an awesome low-cost model for any kitchen, proving that the Avanti is no pushover when it comes to top quality kitchen faucets. Last on the list is the Hanover, which is a mashup of a lot of the other kitchen faucets on the list. It is a mid-priced model that is a jack of all trades, but master of none. It is another Watersense certified product that’s available with either 1.8 or 2.2 GPM, meeting many of the same regulations that made the other options so viable. The two colors available for the Hanover are Tuscan bronze and stainless steel, with the former looking better than the latter — not because the stainless steel looks bad, but because the Tuscan bronze looks so good! As a bonus, this is the only one on the list that has a deckplate, and they even went all out and made it decorative. It’s a steal at this price, and to make it even better, the entire set comes with a soap dispenser. This is the best bargain out of the four listed, and is a good indicator of how Pfister should design the rest of its kitchen faucet line. Innovation is also key in this model due to the anti-splash spray volume control feature. The easy-to-master feature gives you full control of the water volume coming out of the spray head, making one-handed operations a breeze. Combine that with the 75-inch nylon hose and you’ve got a pretty good overall deal. The only thing you need to install the entire set is plumber’s putty, an adjustable wrench, and supply lines. As one of the better deals on the list, the Hanover really solidifies the Pfister lineup. Customizing this unit won’t be a problem and it comes with instructions for a 1-,2-, 3- or even 4-hole installation. The optional deck plate allows users to easily intergrate it with the rest of the kitchen, even if this is their first time installing a kitchen faucet. The Cagney’s high arc spout gives great reach when in use, with good temperature and flow control from the one-handed operation. The easy-to-use spray head has the functions spray, pause, and stream. All of these functions can be used with one hand, making the Cagney an awesome choice for large kitchens. Second on the list and just as good as the rest, this middle-priced option should meet a lot of your kitchen needs. Pfister has amazingly been around since 1910, making it one of the oldest companies in the business. Founders Emil Price and William Pfister started the company with a single garden faucet as its first product. Over the years, it has wavered in the market, sometimes being on top and in other instances being average. It isn’t a flashy company by any stretch of the imagination, so that may have something to do with the fluctuation. Up until 2010 the company was known as Price Pfister, and other than kitchen faucets, it produces bathroom faucets, shower systems, plumbing fixtures, shower heads, and more. It may not be considered one of the big three brands, but there are millions of homes worldwide that use its products. Currently, Pfister is owned by Spectrum Brands Holdings Incorporated after a 1.4-billion-dollar acquisition. At one point, it was part of the Black and Decker brand, and since 2012 it has been restructuring some of its best models. Not going with a big brand isn’t a bad thing, especially with kitchen faucets like the Hanover. Pfister has proven time and again that it can make quality products to go up against any other company. So when the time comes to improve (or create) the kitchen of your dreams, Pfister is the best bet to make that happen.